The purpose of the events is to provide you with a mechanism to style or modify the exported data. When you call the Export method of RadGridView, the ElementExporting and ElementExported events are fired. If you are using the more recently introduced ExportToXlsx and ExportToPdf methods, you should take advantage of the ElementExportingToDocument and ElementExportedToDocument events. The ElementExporting and ElementExportingToDocument events can be cancelled for a particular row or cell. If they are not cancelled - the ElementExported or ElementExportedToDocument event is fired for the associated RadGridView. You can subscribe to the events either declaratively or from the code-behind, as shown in the next three examples. Cancel: Gets or sets a boolean value that indicates whether the event should be canceled or not. Context: Gets the current context. Element: Gets the current element that is about to be exported. Format: Gets the current export format. Value: Gets or sets the value to be exported. ShouldEncodeValue: Gets or sets a value indicating whether special characters in the cell value will be escaped. You can use the Element property in combination with the Cancel property to omit the export of a certain element. As of version Q1 2015, we have removed the obsolete class GridViewExportEventArgs as well as the TextAlignment, VerticalAlignment, Background, Foreground, FontFamily, FontSize, FontWeight, Width, Height, Styles and Attributes properties from the GridViewElementExportingEventArgs class. You can find detailed instructions on how to migrate your existing code related to styling in the Backward Compatibility article. Element: Gets the current element. You can use the ElementExported event if you want to write additional data to the stream. A common scenario is to add Row Details to the exported data, as shown in Example 3. Cancel: The event is cancelable. DataContext: The DataContext of the corresponding visual element. 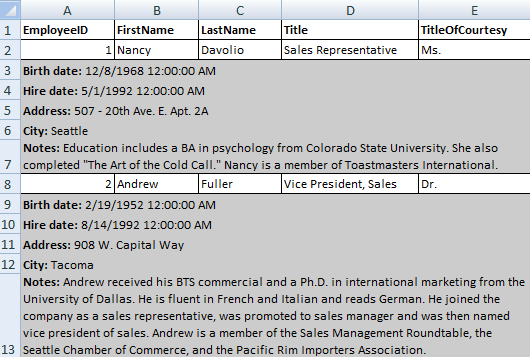 For example, the DataContext of a row is its corresponding data item. Value: The value to be exported. VisualParameters: They are of type GridViewDocumentVisualExportParameters and have a Style property that is of type CellSelectionStyle. It provides the ability to set the FontSize, Fill, etc., for the exported document. DataContext: The DataContext of the corresponding visual element. This event will be only raised when exporting with ExportFormat.ExcelML. You can define a style when the InitializingExcelMLStyles event is raised, as shown in Example 4. Horizontal: You can choose a specific alignment through the ExcelMLHorizontalAlignment enumeration. Vertical: You can choose a specific alignment through the ExcelMLVerticalAlignment enumeration. Underline: You can choose a specific underline through ExcelMLUnderline. Color: You must also set a pattern in order to be applied in Interior.Color. Pattern: You can choose a specific pattern through ExcelMLPattern. PatternColor: You must also set a pattern in order to be applied in Interior.PatternColor. Example 5 shows how to use ExcelMLStyle.